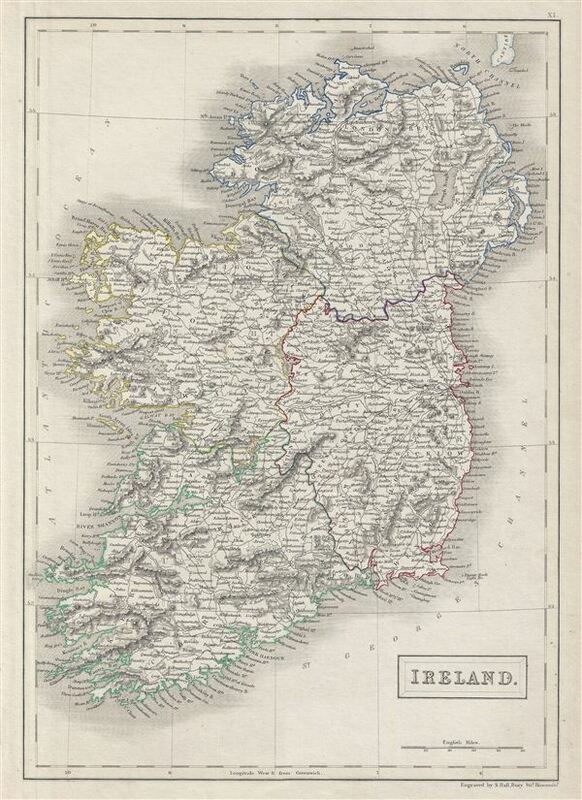 A fine example of Adam and Charles Black's 1840 map of Ireland. The map covers all of Ireland divided according to the four ancient provinces of Leister, Ulster, Munster and Connacht. After the Norman Invasion the old provincial structure was supplemented with modern system of counties – even so the old counties are still referenced today. In 1801, the island of Ireland became part of the United Kingdom of Great Britain and Ireland. Though Britain was flourished during this period, Ireland would witness the Great Irish Famine from 1845-1849 causing mass starvation and emigration. This map was engraved by S. Hall for issue in the 1840 edition of Black's General Atlas. Rumsey 2305.020 (1854 edition). Philips (atlases) 4334.